Thousands of Reasons to Take a Look. With a University of the Sciences education, you’ll be in high demand. And we have the proof to back it up. With our focus on hands-on education and real-world experiences in health care, science, and the pharmaceutical industries, you’ll work side-by-side with experienced practitioners, sharpening the skills you learned in the classroom by putting them into practice. Our students participate in research projects early and often, with access to a host of internship opportunities and clinical rotations with leading health care companies and facilities. And now there’s one more great reason to apply: a USciences education just became more affordable. Beginning in fall 2018, students who enroll as undergraduates won’t pay more than $25,000 per year in tuition and fees. And for those students who are accepted into one of our accelerated six-year doctoral programs in Pharmacy, Physical Therapy, or Occupational Therapy, we’ve lowered and simplified our tuition and fees. Visit usciences.edu/lowertuition. 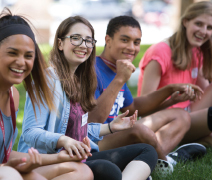 Located in the University City section of Philadelphia, USciences’s green and modern 36-acre campus shares a vibrant neighborhood with more than 40,000 other college students. We’re a short walk or trolley ride away from Philly’s amazing restaurants, vibrant culture, sports, shopping, and other universities. We’re within a two-hour drive of 75% of all pharmaceutical companies. Our location offers access to 800+ life sciences, pharmaceutical, and biotech companies; 15 major health systems with 100+ hospitals; 2,000+ medical technology companies; and seven medical schools. On campus, you’ll be surrounded by approximately 2,500 students from around the world and have the chance to participate in 90+ student organizations, cheer on 12 NCAA athletic teams, or join one of 14 fraternities and sororities. When accepted into USciences as a first-year student in Pharmacy, Physical Therapy, or Occupational Therapy, you’ll be simultaneously accepted into the professional program. As long as you meet academic standards, you won’t have to reapply to gain a seat in the professional phase, nor will you be required to take the PCAT or GRE. Direct-entry programs prepare you for professional licensure on an accelerated timeline. 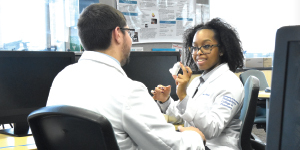 Pharmacy: Founded in 1821 as the Philadelphia College of Pharmacy (PCP), North America’s first college of pharmacy, USciences is the first to offer a competency-driven and student-centered professional curriculum. Our Ready + 4™ PharmD program pairs the professional phase with a general education curriculum in the undergraduate years to prepare you for your professional studies. The new competency-driven curriculum combines both the science and the practice of pharmacy and is delivered as modules, allowing you to focus on just one or two courses at a time. 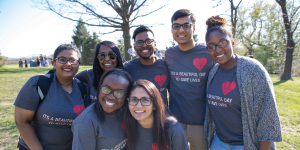 Through interprofessional experiences, clinical rotations, and elective course work, you can tailor your program to match your unique interests, preparing you for the evolving field of pharmacy. Physical Therapy: Our Doctor of Physical Therapy (DPT) program is a hands-on clinical program taught by doctoral-trained, clinically certified specialists. You’ll start working with real patients in the first year of your professional curriculum and participate in full-time clinical work at locations nationwide with more than 200 companies, as well as in our pro bono community clinics. If you enter as a freshman, you can complete the DPT in just six years. And our DPT program requires no reapplication for the professional years as long as you maintain the required GPA. Occupational Therapy: USciences is one of only a handful of universities in the US to offer an accelerated pathway to the clinical Doctorate of Occupational Therapy (DrOT). Our OT program gives you the necessary knowledge and skills to make an impact on a broad range of patient/client challenges. The Accreditation Council for Occupational Therapy Education requires all graduates of OT programs to have a minimum of a master’s degree. USciences’ DrOT will put you ahead, setting you up to be a leader in the growing field of occupational therapy. Physician Assistant: Our pre-professional PA program combines foundational course work with patient contact and shadowing to prepare you for graduate studies. If program standards for progression are maintained, you will be eligible in your third year to interview with the 27-month, year-round graduate professional PA program at the Philadelphia College of Osteopathic Medicine. Ours is one of just a few programs nationwide to offer specific course work in patient history–taking and physical exam skills—both of which will prepare you for the scope of practice of a physician assistant. Eleven USciences majors include all of the required/recommended courses for medical school. Beginning in your first year, you will work with a pre-medical advisor to help you meet your career goals in dentistry, medicine, optometry, podiatry, veterinary medicine, or other health care professions. And USciences maintains a number of cooperative agreements with institutions that offer professional health care degrees. For a complete listing, visit usciences.edu/premed.